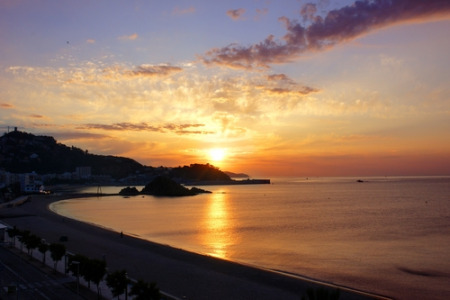 Costa d'en Blanes holidays take you to the south west coast of Majorca. As well as being a resort, it is a residential area so the atmosphere is fairly sedate. Benefitting from short transfers only seven ten kilometres from the capital Palma. Costa d'en Blanes appeals to those wishing for relaxed days with the opportunity for lively evenings in neighbouring resorts. It is ideal for exploring Palma as well as the beautiful south west of the island. Although there are three good sandy beaches, families with small children may be deterred because of the twenty minute walk that is required to reach the shore. With low cost airlines flying to Majorca from regional airports, travelling to the island has never been cheaper. Cheap Costa d'en Blanes holidays can be taken from April until late October with temperatures rising into the thirties at the height of summer. With fairly mild winters, the golf courses attract aficionados of the sport. The standard of both accommodation and service are high and there are restaurants serving menus to suit all tastes. If you are new to Spanish cuisine order tapas and you'll be give a variety of tasty morsels. The long gap between lunch and dinner gives the opportunity of snacking on tapas perhaps washed down with sangria or a smooth Spanish wine. If a holiday is incomplete without a shopping trip, you should head for Palma where there are shops galore. Nightlife in Costa d'en Blanes is very quiet, but there are many venues in neighbouring resorts where those who wish can party through the night. The area has many tourist attractions including water parks and Fantasia Golf, crazy golf courses set in stunning gardens. In order to make the most of your holiday, car hire is recommended. Search for cheap Costa d’en Blanes holidays today. If you find a cheap Costa d'en Blanes holiday appealing and you wish to avoid the tiresome task of trawling through web page after web page trying to find the best deal, try our simple search facility. You'll find over three dozen travel companies competing for your custom. It is simple to use and remember, competition brings out the best bargains. Our search facility enables you to see, at a glance, the Costa d'en Blanes holiday that is the cheapest and the one that offers the best value for money. All you have to do to secure the holiday is make a phone call. To book the best deal, and to avoid disappointment, ring today.